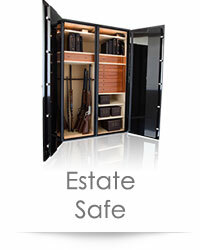 Vault Door Buying Tips - Buying Guide to High Security Vaults and Vault Doors - Brown Safe Mfg. A vault door is a large secure door used to create custom-built vaults large enough to allow walk-in access. 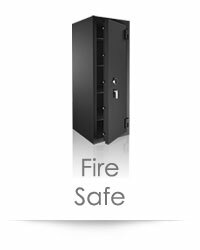 A solid vault provides the highest level of burglary and fire protection. Can be concealed relatively easily. Roomy enough to store just about anything. Custom vault interiors can be made to accommodate a wide range of items. 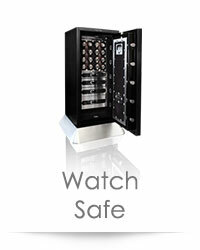 All Brown Safe vault doors include an inner escape device to avoid accidental lock-ins. This also allows the vault to be used as a panic room. Constructing a vault is a major undertaking, ideally built at the same time a home is being constructed. The cost of building a vault can be quite high. 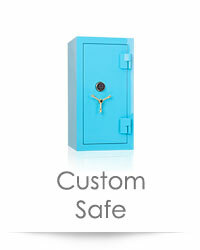 All too often, safes go unused when they are located too far away to be conveniently accessed. Many times a new safe buyer will overthink the planned location for their safe, locating it in some cleverly concealed location or disguising the safe behind false doors or walls. While concealing your safe is fine, don't do this at the cost of overall convenience or the safe will likely fall out of use over time. It's far better to store your commonly used valuables in a not-so-hidden safe than to have these items left out for easy pilfering. Rather than out thinking the burglar along with yourself, rely on the safe to perform its job of protection and place it where it's likely to get the most use. 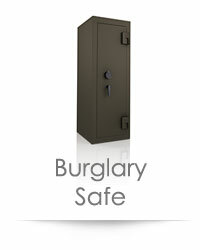 If your home is burglarized, a well-built burglary safe will faithfully protect your contents. It can sometimes be difficult to install vaults in locations that are conveniently accessible. Many homeowners in this situation find that owning a vault and a small safe allows for convenient access to their daily use items, while still having ample space for the important items used less often. 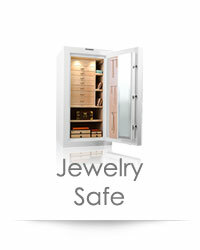 By locating a small to mid-size Jewelry Safe in the bedroom or closet, commonly used items remain conveniently accessible and protected. It is essential that the vault door you purchase has a continuous solid steel plate of substantial thickness. Without this base level of steel protection, any vault door can be opened within minutes despite the hoopla of additional advertised protection features. The majority of vault doors on the market tout a plethora of protection features, but virtually all fail miserably in this essential area. 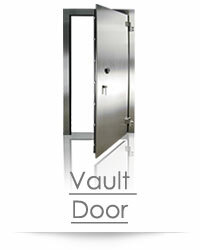 The vault you choose must have at minimum a ½" thick solid steel door. Steel is very expensive and heavy, vastly increasing the door's build cost and the cost of shipping overseas to the reseller. As a result, nearly all oversea-manufactured vault doors (and even many locally built vault doors) cut these costs by constructing their doors with thin sheet metal wrapped around various forms of drywall to give the appearance of a robust door. Be highly suspect if the vault manufacturer or reseller doesn't state solid steel or lists "composite" for their door material, as this can be anything from sheet metal wrapped around wood to sheet metal and drywall. Also be on the lookout for vault sellers that list just 'door thickness' rather than the barrier material type and thickness as this is a recent trick many underhanded vault marketers employ. By listing the total thickness of the vault door including the dial, barrier material, airspace, inner boltwork, etc., the provided figure can sound quite impressive while actually preventing the buyer from obtaining any solid information on how thick the barrier material actually is or what it's made of. Weight is one of the biggest factors when determining the base ability of a vault door to protect from both burglary and fire. Steel is heavy. A quality vault door with solid steel walls will weigh substantially more than a flimsy door fabricated by wrapping sheet metal around insulation panels. High-density concrete-based, amalgamate is heavy. A concrete amalgamate-based composite fire vault door will weigh substantially more than a door that uses insulation panels. Steel and high-density concrete amalgamate together are really heavy. A true burglary vault door with solid steel walls and concrete amalgamate fire cladding often carries three time the mass of an equivalent-size door constructed from sheet metal and drywall panels. These are the vault doors to look for. If a vault door is heavy, it doesn't necessarily mean the door carries a lot of solid steel. The weight can come from the concrete amalgamate alone. To determine the amount of solid steel used by a door, it's best to learn the actual steel thickness. Although fire vault doors constructed with fireboard, drywall, fiberboard, or other panel based insulation materials make up the majority of doors sold today, they provide inferior fire protection when compared to true composite fire vault doors or composite-clad fire vault doors. More importantly, vault doors constructed with insulation panels often provide little to no burglary protection. A vault that is slow to open or access is a vault you are less likely to use. Adding an electronic lock can make opening the vault door quick and easy, as well as enabling the user to reset the combination when needed without the aid of a locksmith or combination kit. For the ultimate in user convenience and security, a high-grade biometric lock can't be beat. Does the size of your chosen vault door make best use of the space it's occupying? 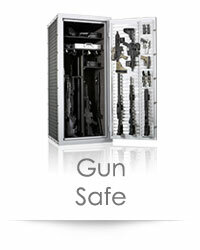 Brown Safe is one the only vault manufacturers in the world to offer fully customizable vault doors. Custom sizes and finishes are available at a very reasonable price point. We can work with you and/or your interior designer, architect, and contractor to ensure a quality vault built to your exact specifications. Concrete block is usually the least expensive construction method. Blocks sized 8" or greater are recommended to ensure adequate security. Manufactured by building concrete forms inside and out, then pouring concrete. High-PSI concrete is recommended for added security. The vault room is constructed of solid steel plating. A minimum of ½" thick hot rolled armor plate steel is recommended. It's recommended you use at least ½" diameter carbon steel rebar. Vault rooms constructed with concrete block should have rebar placed in every cell vertically and horizontally, then filled solid with concrete. Vault rooms made by poured in place construction should have 1-2 curtains of rebar on staggered 8" centers. This will provide a vault with no hole or opening larger than 4". High strength concrete, with a minimum of 3000-6000 PSI, is recommended. Ideally concrete should be 5000-6000 PSI for added strength. When using high PSI concrete, include a material such as Stealth Fibermesh® which forms minute channels for vaporizing moisture to escape. This prevents the concrete from fracturing or even exploding when over heated. Steel chaff can be added for increased burglary protection, but will decrease the overall fire protection of the vault. The construction and thickness of the vault's floor and ceiling should be equal to that of the vault walls. Ducting should be rebar-obstructed and of a narrow rectangular shape. When constructing the vault room, it is important to keep the door opening as square and true as possible for easier vault door installation. Emergency lighting and ventilation are recommended for all vault rooms.